Trim ends off asparagus. Wrap asparagus in a damp paper towel, and microwave for 45 seconds. Chop into 2-inch pieces. To a skillet over medium-high heat, add 2 tablespoons olive oil. Add mushrooms and sauté 4-5 minutes until crispy and brown, stirring occasionally. Add another tablespoon of oil to skillet, and add chopped garlic and asparagus to the mushrooms; cook, stirring continuously for 1 minute. Remove from heat. 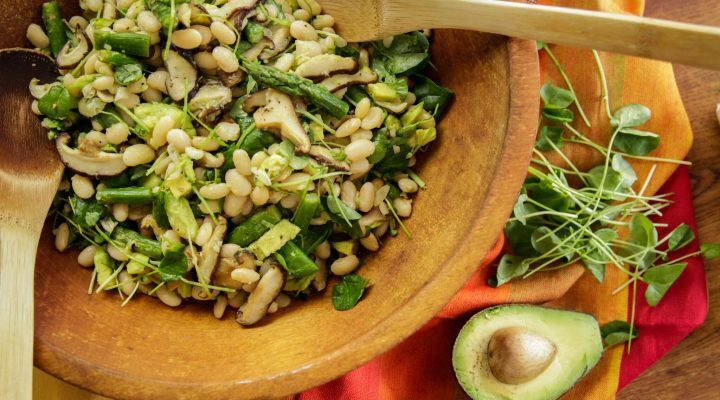 To a large bowl, add asparagus & mushroom mixture, cooked beans, watercress, avocado, lemon juice, and lemon zest; toss gently and serve.